Proper footcare is crucial to maintaining healthy feet, especially when you have diabetes. If wounds go unnoticed, they can cause irreversible damage to the feet and lead to other health problems. Dr. Paul Georges and his staff at Prime Foot and Ankle Care offer many options for providing diabetic foot care. That includes observation, exams, diagnosis, individual treatment, and more. Visit Dr. Georges -- your local diabetic foot care expert -- at Prime Foot and Ankle Care to receive treatment for diabetic foot problems. Dr. Georges serves the greater Lowell, Massachusetts area, including Chelmsford, Dracut, Tewksbury, Westford, Billerica, and Tyngsboro. How does diabetes compromise foot health? If you have diabetes, you are at high risk of developing peripheral neuropathy, a condition that damages the nerves of the peripheral nervous system. Peripheral neuropathy is characterized by numbness, tingling, and pain in the feet, and can eventually make walking difficult or even impossible. Diabetics are also at increased risk of sores that don’t heal appropriately for two reasons: 1) decreased blood flow to the foot prevents proper healing, and 2) peripheral neuropathy increases the risk of a sore going unnoticed for long periods of time. When open sores don’t receive the medical attention they require, the bone and tissue around the wound can become infected and even die. Diabetics are at high risk of amputations due to serious ulcers of the foot and ankle. Along with self-inspection, regular diabetic foot care from a trained professional is essential to avoiding major complications from this disease. 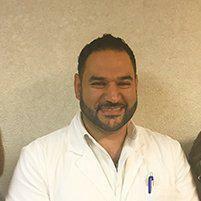 Any wound that isn’t healing, or is a concern to the patient, should see Dr. Georges immediately: He’ll diagnose and treat the wound to heal it and prevent any further damage. Can diabetic foot complications be prevented? The single most important thing you can do to prevent irreversible complications of diabetes on the feet is to control your blood sugar levels. When your diabetes is well-controlled, your risk of complications decreases significantly. The second most important measure you can take to prevent foot conditions from becoming serious is to conduct daily examinations of your feet. Because diabetics often lose sensation in their feet, it’s difficult to detect open skin and sores. Checking your feet for abnormalities daily is a critical component of prevention and early treatment. When checking your feet, take special care to check between your toes and the soles of your feet. You should be searching for dry, cracked skin, blisters, calluses, ingrown toenails, and open sores. If you notice any of these problems, you should immediately call Prime Foot and Ankle Care to schedule an appointment with Dr. Georges.